Israeli Salad aka/ Arab Salad is light, healthy and refreshing. Full of antioxidants, enzymes, vitamins, and minerals, this salad is sure to become one of your Spring and Summer favorite recipe. 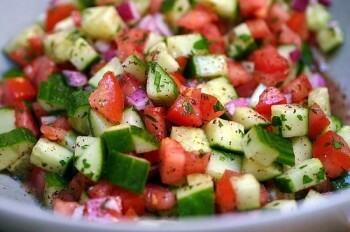 Chopped tomatoes, cucumbers, onions, and parsley combined with a drizzle dressing of lemon juice, olive oil, garlic, and mint leaves. Goes great in a pita with falafel, hummus, and tahini, but also works as a side dish with any middle eastern, Greek, or even American Food.